Okabe goes shopping for pudding, and receives another mysterious threat. Episode 11 of Steins;Gate introduces a new concept: the time leap. A time leap occurs when one pushes one’s current memory state back in time to a previous you. Presumably this avoids the problem of jellification, as instead of sending the entire mass of the human backwards in time, only the energy pattern (information) is sent. Seemingly it is Okabe’s discovery of the time leap that triggers another threatening message. This post speculates about who might be sending Okabe these threatening messages. I guess we can rule out these two. Assuming the timing of the email is relevant, Christina and Mayushii can be ruled out, they both share an alibi. An argument could be made for each that she has a motive, however. 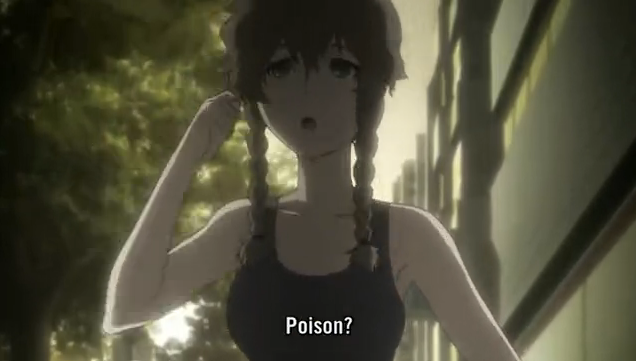 In Christina’s case it is mostly hearsay and guilt by association, as Suzuha has warned Okabe that Christina “works with SERN”. I would say such a relationship is possible; at the least her father is an experimental physicist with interest in time travel, so she might have had some passing association, or perhaps there is a misunderstanding based on her father’s activities, or perhaps Suzuha has information about future events. 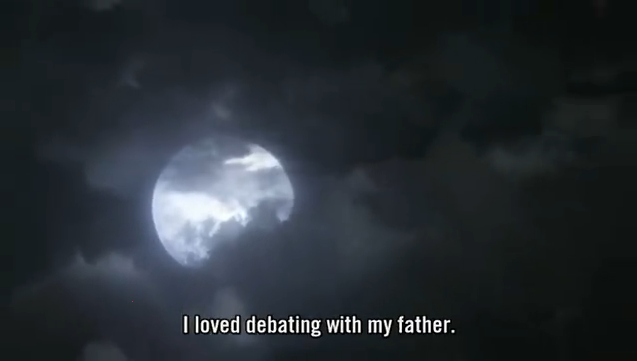 In Mayushii’s case, she sounds disturbed as she discusses time leaps with Okabe, essentially arguing that they should stop, or at least not go further. Really her position was a more gentle way of saying what the “threat” sent to Okabe said, “you know too much”. Suzuha could have sent the message, but she doesn’t have a discernible motive. There are some who think that Suzuha has also been contacting Okabe using the name John Titor. She truly is an enigma, and thus likely to draw any number of crazy theories. In this case, whether or not she is also John Titor, John Titor does not seem to have a motive. In fact, up until now, John Titor has only attempted to encourage Okabe. Moeka is a pretty good candidate for a few reasons. Although we don’t know of a motive, she certainly has opportunity, having Okabe’s number, being compulsive about taking photos with her cell phone, and having a mysterious interest in time travel that seemingly predated her first contact with Okabe. She also has a bizarre encounter with Okabe and Mayushii in this episode in which she asks if they have gotten rid of the time machine, and then acts alternately intense and numb when being told they can now send memories through time. In fact, if I were going to pick a suspect just on observed behavior, I would say Moeka wins it. Sending anonymous threatening emails sounds like something she does to all her ex-boyfriends. Aah, it’s all part of her stalker-ish charm. He's in Aomori, "the Blue Forest". There are two remaining candidate suspects. First, SERN, which seems to have hacked Okabe’s lab. First of all, Daru, :face palm: What the hell man? I almost added you to this list because an elite hacker should know better. If SERN has hacked the lab, they certainly could be said to be watching Okabe, as the first message said. Another character who has a potential connection to SERN, and just as much motivation to stop their research, whether he actually is associated with them or not is Christina’s father. As this episode revealed, he is very jealous (not jell-ish) of her progress, and specifically would not want her to succeed at time travel (seemingly his research specialty). She even describes him as “going insane .. even more than last time”, which is the best fit for the threatening photos (outside of Moeka-san). At this point I’m leaning towards Cristina’s father (name subject to later discovery) as being the culprit sending the threatening messages to Okabe. This is especially because Okabe and Christina plan to travel to Aomori to meet with him. In fact, this episode even has me reconsidering some earlier tentative theories, particularly the identity of Christina’s killer. Suzuha has seemed like the most likely suspect, but we now have an individual with a tangible motive. 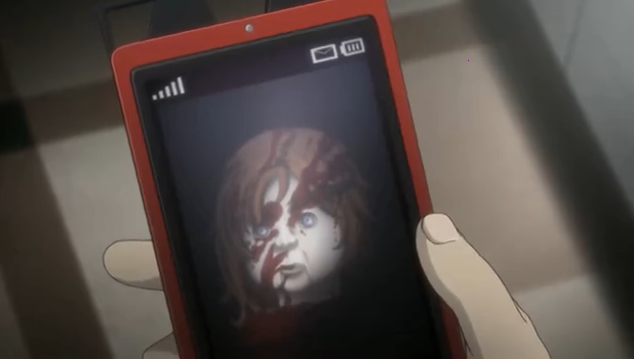 In fact, there is still the possibility that Suzuha is working FOR Christina’s father, and was sent (into the past?) to prevent Christina from creating the time travel machine. 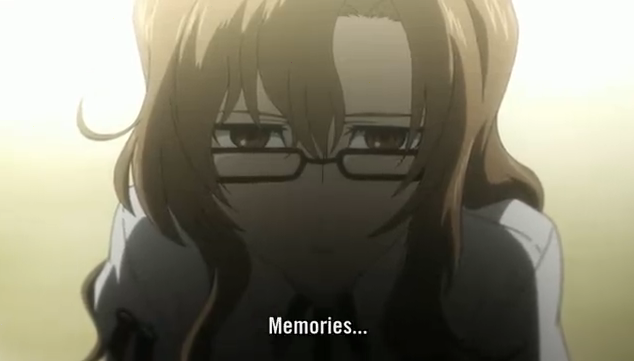 Personally I thought this was an excellent episode, which exemplified the strength of Steins;Gate. New information was dished out, but in such a way that multiple, conflicting theories can be formed. This is an excellent mystery-style show. 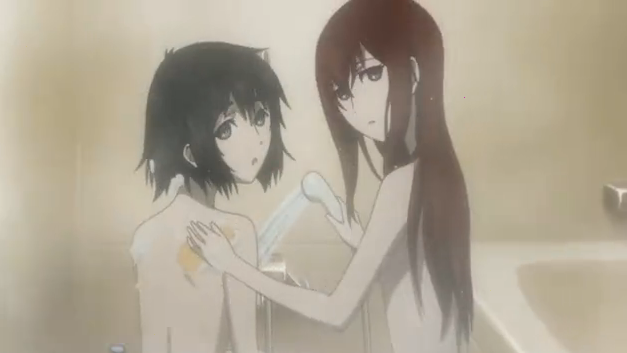 Steins;Gate has been solid all season, and I am really looking forward to seeing what happens in the second course. SERN seems to be the most likely source for the message at this point. It would just be ridiculously out of character for it to have come from Mayuri, and Kurisu has an alibi (although not a foolproof one as she could have used a program to send the message on a delay). Suzuha’s accusation that Kurisu works for SERN throws a spanner in the works. The distinct possibility that Suzuha is a time traveler might allow her to be truthful at the same time as Kurisu is innocent. If not, someone’s lying. At the very least, it adds another layer of doubt and complication to how Okabe sees things right now. I’m still thinking Christina’s dad. He might be working with SERN, so that might amount to the same thing. I too highly suspect that SERN is the source for the message. The only other one I could see the message potentially coming from is Moeka, though she would have to have done it from a different cellphone from the one she currently uses. What I’m wondering is for what reason is there some sort of entity that is against Okabe doing time travel experiments. He himself isn’t causing any direct harm to anybody around him, and what he does shouldn’t be relevant to other people’s research for the most part (SERN being an exception). The only logical conclusion I can think up is that SERN sees the experiments as a conflict of interest, though even then their motivation for being hostile is still ambiguous at best. This is why I still think it is Christina’s father. He has motive: he doesn’t want Christina to beat him to the discovery. He also might be crazy. There was a strong hint that he was physically violent with her in the past (when she cowered as Okabe raised hi voice). I also think sending threatening emails is more like something a deranged person who seeks to neutralize a competitor would do, instead of something an organization like SERN would do. They are more likely to steal his research, or try to co-opt Okabe, I would imagine. my friends SERN has been in their system since the momment they connected. They know everything they do because they use the computer to keep info and search info. Now how is it that someone is keeping a eye on them i can only guess that the lovely Moeka is highly suspect due to her never being around. Though i have my theory that between Moeka or Suzuha could one of the two be john titor…. who knows. I do know this…from what i can tell apparently SERN has some way of keeping track of their progress nomatter what time line is present this is something thats even more interesting and i hope we find out more about this soon. Whatever the case john titor is correct that SERN needs to be brought down. anyone who would hurt little mayuri should be destroyed! Also i agree with a previous post suzuha seems to have future knowlege or something and a serious chip on her shoulder she nearly whacked christina in the ep where they first met and she cant stand to be around her. god i wanna see those two fight just once!!! Whoever the message is from, I doubt that it’s from SERN. I might be wrong about this, but I’m assuming that SERN let Daru hack them for some reason, possibly because they want the group to know… something. If this is the case, why send threatening messages to Okarin to warn him away from the rabbit hole? This line of reasoning is pretty shaky, granted, and if any of this is wrong than the whole thing comes tumbling down. Christina’s dad does seem the most suspicious right now. If the message really is a “stop sticking your nose into this” type of warning, I wouldn’t be surprised if it were he who sent it, given his history and hatred of his daughter (and her companions, presumably). We don’t know much about him other than what Christina told us, but he’s almost certainly an important figure in this whole thing and he has a reason to hate the group. I think there is still a chance that Christina’s father is working with SERN, but otherwise I agree with you.